HOSTING EVENTS FOR NEARLY 100 YEARS! The Don Room at El Cortez opened on Thanksgiving Day in 1927 and is nestled atop San Diego’s prestigious Cortez Hill. 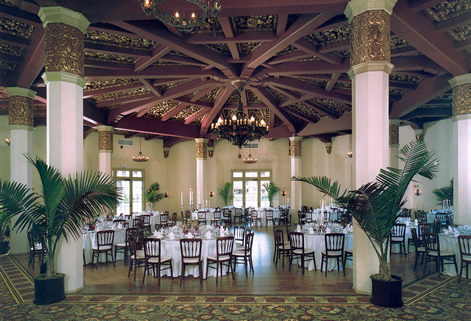 This carefully restored landmark has been hosting San Diego ‘s finest events for nearly 100 years! The esteemed Don Room and Terrace is the perfect choice for your special event. The classic and stunningly beautiful octagon shaped Don Room with 24k gold leafed ceiling, is an ideal setting for events and flexible to most any format. Adjoining the Don Room is a 10,000 square foot outdoor Terrace. The area comes alive with exquisite lighting, and our first class bar service offers drinks to delight and warm the spirits. Whatever the occasion our pre-determined layouts offer ease when planning your special event! Events in the Don Room at El Cortez are always fun with an added touch of vintage glamour! We offer the finest events and planning services to help keep you stress-free so that you can relax knowing that your function will go off without a hitch. There are many aspects that go into a successful function, and food and beverage is at the top of the list. Our preferred caterers were carefully chosen for their consistent hard work, preparations, experience and the use of healthy ingredients. Menus focus on client preference, sustainability, and seasonality to ultimately bring a delicious plate to your guest tables. Music moves the soul! Set an exciting or relaxed mood for your San Diego wedding or special event with the lively sounds from one of our preferred disc jockeys, and we also provide recommendations for experts in the field of invitations, floral design, and a host of other vendors all with whom we will coordinate to make your event, this event, the very best! The Terrace at El Cortez provides 10,000 square feet of unobstructed outdoor space for your guests to mingle and chat as they delight in the ambiance of its urban fireplace. 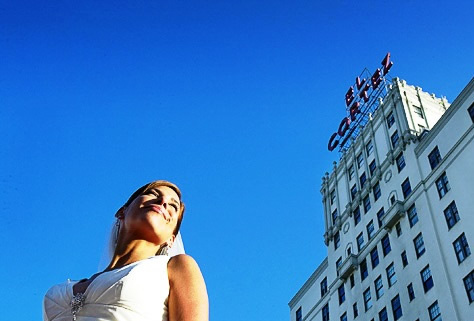 If it is your wedding that brings you to El Cortez, the fountain is a popular focal point where couples join in marriage under a grand, vine covered gazebo. Décor may include an arbor, a rose lined path of topiary and hurricane candles are often used to light a romantic path. The Terrace has also been used for a winter themed event with man-made snow and accented with beautiful blue lighting. Whatever your theme, allow our venue to serve your dream event! Known as one of the most beautiful wedding venue locations in San Diego, The Don Room promises an event to remember! When you book your event we ensure that everything is perfect, and guarantee that even the most discerning guest on your invite list will enjoy a fun and memorable time. Contact The Don Room now to get started!